Language*: Martin Coady spoke English. [S9] Births, Church Record, June 1977 to September 1944 St. Joseph's Church, Margaree, Records, page 6, line 8. [S9] Births, Church Record, June 1977 to September 1944 St. Joseph's Church, Margaree, Records, page 26, line 6. The National Archives at Washington, D.C.; Washington, D.C.; Alphabetical Manifest Cards of Alien Arrivals at Calais, Maine, ca. 1906-1952; Record Group Title: Records of the Immigration and Naturalization Service, 1787 - 2004; Record Group Number: 85; Series Number: M2042; Roll Number: 004. [S857] Catherine Jessie MacFarlane, 022-07-7163, SSDI Catherine J. MacFarlane ID# 2763, Social Security Death Index, 1935-2014. [S9] Births, Church Record, June 1977 to September 1944 St. Joseph's Church, Margaree, Records, page 40, line 9. "The MacEacherns of Mount Young and Hawthorne." [S9] Births, Church Record, June 1977 to September 1944 St. Joseph's Church, Margaree, Records, page 44, line 11. 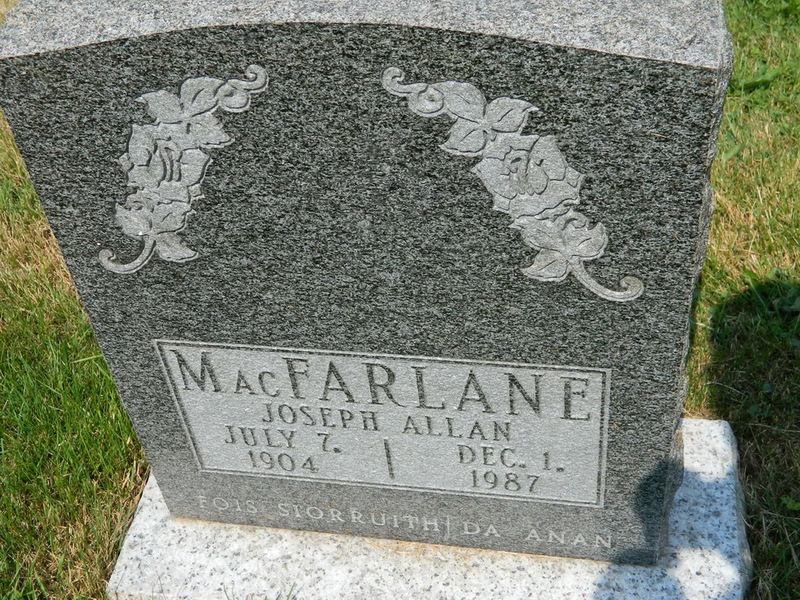 [S204] MacFarlane-MacEachen, July 4, 1946. Ancestry.com.U.S., Social Security Death Index, 1935-2014[database on-line]. Provo, UT, USA: Ancestry.com Operations Inc, 2014. [S100] Obituaries from The Casket Newspaper, 1852 - present, Obituary of Mrs. Joseph Allan MacFarlane, 110-1963-30-6. [S861] Ancestry.com, online www.ancestry.com, http://search.ancestry.com/cgi-bin/sse.dll,%20canada&msbpn=5005&msdpn__ftp=nova%20scotia,%20canada&msdpn=5005≠w=1&rank=1&redir=false&gss=angs-c&successSource=Search&_phtarg=tVE1358,tVE1364&pcat=BMD_DEATH&h=1873812&dbid=60527&indiv=1&ml_rpos=89. Fortified by the last rites of the Catholic Church, of which she was always a fervent member, one of Sedley’s best known and most beloved citizens, Mrs. Peter Vanscheltinga, passed to her Eternal Home on October 31, 1955. The late Mrs. Vanscheltinga (nee Rose MacFarlane) was born at South West Margaree and was the daughter of John Dougald MacFarlane and Annie Kennedy. Early in life she went to the Canadian West, where she gave her best energy to the interest of education, and was a most successful teacher in the school there. After her marriage in Sedley, Saskatchewan, she devoted herself, heart and soul, to every movement of that community. It was here especially, by her sound christian living, her kindness and sincerity that she won for herself a host of friends, who are the better because of their contact with her, and who now bemoan the loss of a loyal and generous friend. Although in frail health for some time her death came as a shock to her many relatives and friends everywhere. Her husband predeceased her by ten years. Of their family of four one died in infancy. Of the other three Dr. Douglas Vanscheltinga is practicing in Regina. Two daughters, Audrey at home, Cecelia in California. Also by six sisters and four brothers, Marie in new York, Annie Katherine (Mrs. MacKay); Kate Jessie, Jessie (Mrs. Moore) all of Boston; Margaret (Mrs. Campbell), Inverness, N. S; Allan of Boston; John D. of South West Margaree; Archie and John in Main(sic). [S9] Births, Church Record, June 1977 to September 1944 St. Joseph's Church, Margaree, Records, page 32, line 5. Ancestry.com. Web: Canada, GenWeb Cemetery Index [database on-line]. Provo, UT, USA: Ancestry.com Operations, Inc., 2013. [S678] Allan J. Gillis, "Descendants of John Campbell." [S9] Births, Church Record, June 1977 to September 1944 St. Joseph's Church, Margaree, Records, page 38, line 8. [S341] Registration form to Gathering 2001 Committee, August 3, 2001, Sheet 45. [S5] Marriage, Church Record, November 1884 to September 1935 St. Joseph's Church, Margaree, Records, page 99, line 21. [S9] Births, Church Record, June 1977 to September 1944 St. Joseph's Church, Margaree, Records, page 46, line 15. [S9] Births, Church Record, June 1977 to September 1944 St. Joseph's Church, Margaree, Records, page 42, line 5. [S9] Births, Church Record, June 1977 to September 1944 St. Joseph's Church, Margaree, Records, page 4, line 19. [S1116] 1901 Canada Federal Census, on-line. [S1118] 1871 Canada Federal Census, on-line. Marriage*: He married Margaret Murphy circa 1836. [S361] 1881 Canada Federal Census, 101 Newbury Street, Boston, Suffolk, Massachusetts, USA. Marriage*: She married James Doyle circa 1836. Married Name: As of circa 1836,her married name was Doyle. Death*: Margaret died in 1890. Marriage*: He married Margaret Byrnes. Death*: John died circa 1860. Marriage*: She married John Fleming. Married Name: Her married name was Fleming. Death*: Margaret died circa 1860. Language*: Moses Martin Coady spoke English. [S9] Births, Church Record, June 1977 to September 1944 St. Joseph's Church, Margaree, Records, page 38, line 22. [S494] 1891 Canada Federal Census, 101 Newbury Street, Boston, Suffolk, Massachusetts, USA. [S9] Births, Church Record, June 1977 to September 1944 St. Joseph's Church, Margaree, Records, page 26, line 1. Religion*: John Joseph Gillis was Roman Catholic. [S9] Births, Church Record, June 1977 to September 1944 St. Joseph's Church, Margaree, Records, page 18, line 20. [S818] J. R. Reid, Descendants of Angus MacLellan # 8701, page 111. Religion*: Margaret Catherine Gillis was Roman Catholic. [S9] Births, Church Record, June 1977 to September 1944 St. Joseph's Church, Margaree, Records, page 22, line 1. Year:1940; Census Place:Boston, Suffolk, Massachusetts; Roll:m-t0627-01670; Page:10A; Enumeration District:15-422. Religion*: Mary Catherine Gillis was Roman Catholic. [S9] Births, Church Record, June 1977 to September 1944 St. Joseph's Church, Margaree, Records, page 24, line 12. [S9] Births, Church Record, June 1977 to September 1944 St. Joseph's Church, Margaree, Records, page 26, line 25. [S9] Births, Church Record, June 1977 to September 1944 St. Joseph's Church, Margaree, Records, page 30, line 5. [S9] Births, Church Record, June 1977 to September 1944 St. Joseph's Church, Margaree, Records, page 32, line 28. [S9] Births, Church Record, June 1977 to September 1944 St. Joseph's Church, Margaree, Records, page 38, line 24. [S341] Registration form to Gathering 2001 Committee, August 3, 2001, sheet 47. [S5] Marriage, Church Record, November 1884 to September 1935 St. Joseph's Church, Margaree, Records, page 98, line 2. [S9] Births, Church Record, June 1977 to September 1944 St. Joseph's Church, Margaree, Records, page 44, line 19. [S861] Ancestry.com, online www.ancestry.com, 0861 - 2788 - Catherine Jessie Gillis.docx. [S861] Ancestry.com, online www.ancestry.com, 0861 - 2788a - Catherine Jessie Gillis.docx. [S861] Ancestry.com, online www.ancestry.com, 0861 - 2788c - Catherine Jessie Gillis.docx. [S287] Gillis, Katherine Jessie obituary, December 27, 1999. [S9] Births, Church Record, June 1977 to September 1944 St. Joseph's Church, Margaree, Records, page 60, line 9.